At Vo5 we believe hair shouldn?t be dull, life shouldn?t be boring and you should never restrict your self expression. The Vo5 Heat Protect Spray gives an ultra glossy finish and offers up to 230°C heat defence. Helps protect hair against the damage caused by heat styling tools. Features a heat activated formula to make styling easier. Leaves hair soft and shiny. Vo5: for hair play whatever your style. At Vo5 we believe hair shouldn?t be dull, life shouldn?t be boring and you should never restrict your self expression. The Vo5 Heat Protect Spray gives an ultra glossy finish and offers up to 230°C heat defence. 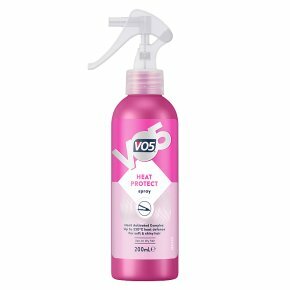 The Heat Protect Spray: Helps protect hair against the damage caused by heat styling tools Features a heat activated formula to make styling easier Leaves hair soft and shiny The Vo5 Heat Protect Spray is a very versatile product and is ideal to create either daytime or evening hair styles. How to use: To unlock spray, press button on side of pump. Apply generously from root to tip onto towel dried hair before heat styling. Use a round bristle brush to blow dry from root to tip. Style tip: Direct hairdryer nozzle downward for maximum sleekness. Finish off with a small amount of Frizz Free Cream. If you liked Vo5 Heat Protect Spray, be sure to check out the other Vo5 styling products in the full range to remix your style and experiment with your hair even further! Don?t forget to leave a product review and share your best hair styling tips. Vo5: for hair play whatever your style Beat Hair Boredom with Vo5 For more style and music inspiration, follow Vo5 on social. Caution: Avoid contact with eyes. If eye contact occurs, rinse well with water without delay. If irritation occurs, discontinue use.